If there is one amazing premium cabin product in the sky that seems to fly under the radar, it’s EVA Airways’ business class, which they call Royal Laurel Class. While this Taiwanese carrier might not have a massive fleet of aircraft, they do operate several routes to and from the United States. Though you might initially think of Singapore Airlines or All Nippon Airways (ANA) business class as a way to fly to Asia, you might want to consider EVA Air for one of these transpacific journeys too. Let’s take a look at the EVA Air business class experience, how to book it, some great redemption options, and tips for earning the necessary points and miles. When Should You Search for Award Space? What Do You Get With EVA Air Business Class? Enjoy direct aisle access and a lie-flat seat in business class on EVA Air. EVA Air uses the extremely popular reverse herringbone business class cabin layout, which means every seat in the cabin will have direct aisle access. Additionally, business class seats can be transitioned into a fully flat bed, so you can rest comfortably during flights that can reach 16 hours long. You’ll also notice that the business class cabin is actually divided into 2 cabins, with the cabin toward the front of the plane being a bit larger. Not to worry though — you have the same cabin layout and seat wherever you sit in business class on EVA Air. Unlike Emirates business class, EVA Air has a much more understated approach to the look of their product. You won’t find the glitz and glamor of wood paneling and gold like on Emirates, but that doesn’t take away from a fantastic experience. 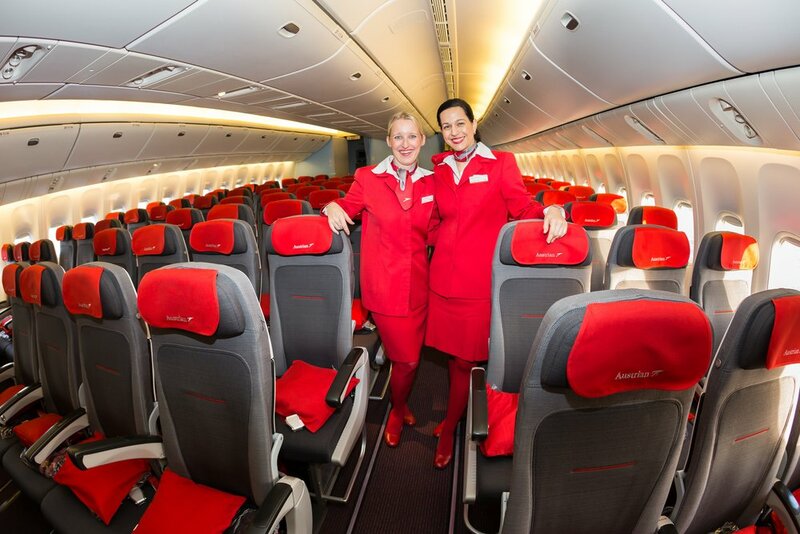 You will be greeted by a cabin crew member at the door of the plane and escorted to your seat. While EVA Air doesn’t have a first class product, it’s this kind of thing that makes their business class product so amazing. Continuing with that trend, EVA Air also offers pajamas to all business class passengers and will serve champagne throughout the flight. Touches like these really make EVA Air business class a luxury experience. If you would like to stay connected to work or friends and family during your flight, EVA Air also has reasonable pricing for Wi-Fi. 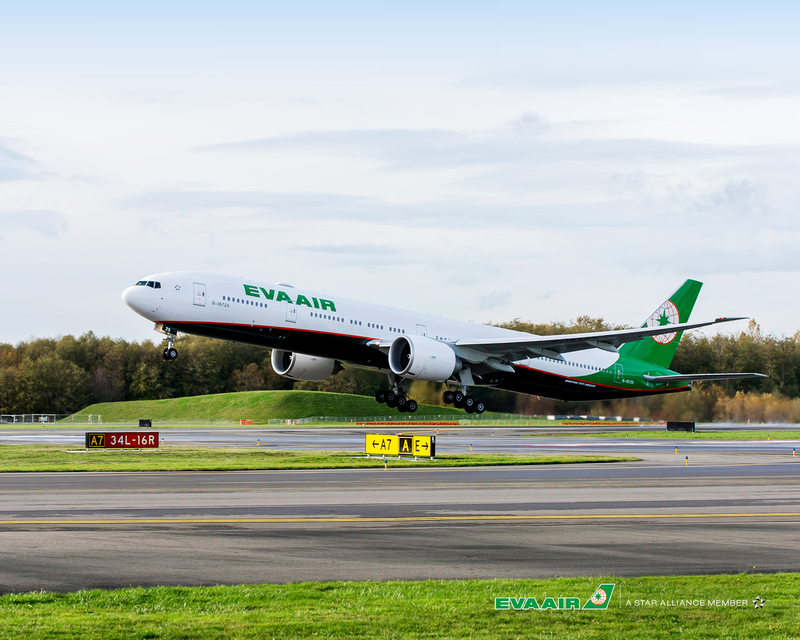 While some carriers have struggled to provide consistent Wi-Fi, EVA Air has received high marks for its Wi-Fi quality on its transpacific routes. If you’re departing from Taiwan Taoyuan International Airport (TPE) in Taipei, make sure you stop by EVA Air’s business class lounge where you can enjoy a nice meal, have a drink, and relax. Now that you have a bit of an idea of what to expect during your business class adventure with EVA Airways, let’s talk about how you can book this flight. As a Star Alliance member, you have plenty of award booking options. 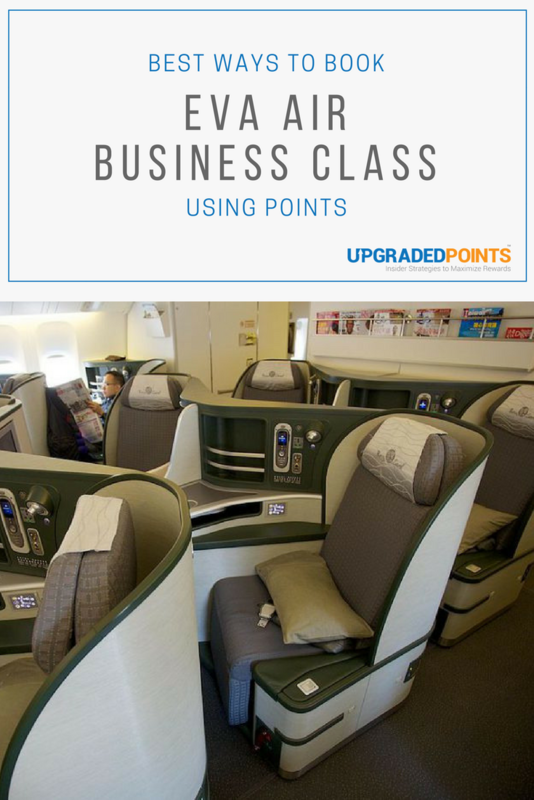 United MileagePlus provides an easy way to book business class awards on EVA Air if you have Chase Ultimate Rewards points. One of the most common ways to book business class award tickets on EVA Air from the U.S. is through United Airlines’ MileagePlus program. By following some simple steps, you can take care of the booking online. If you need more MileagePlus miles to complete your booking, you can transfer Chase Ultimate Rewards points almost instantly at a 1:1 ratio. Hot Tip: Check out some of the other amazing ways to redeem United MileagePlus miles for fun flights around the world. Air Canada Aeroplan is a great way to book one-way awards on EVA Air if you have Amex Membership Rewards. Another airline loyalty program you should consider using to book business class awards on EVA Air is Air Canada’s Aeroplan program. Like United, you can take care of the entire booking process online. Aeroplan might show you several options with other Star Alliance partners, so if you want to fly EVA Air on the long-haul segment across the Pacific Ocean, make sure you check which airline is operating that segment. Hot Tip: Check out our Aeroplan region definition guide to make it easy to find out how many miles you need to book your award. You might have noticed that Aeroplan often passes on carrier-imposed surcharges on some award tickets; fortunately, that won’t be an issue when booking an award on EVA Air. To top off your Air Canada Aeroplan account, you can transfer points from your American Express Membership Rewards at a 1:1 ratio. The transfer is almost instant. ANA Mileage Club is perhaps the best way to book EVA Air business class if you need a round-trip ticket. Often overlooked, All Nippon Airways (ANA) Mileage Club is a great way to book Star Alliance partner award tickets…and booking business class awards on EVA Air is no exception. One important aspect of the ANA Mileage Club program to remember is that they require round-trip award bookings. This means you must find award space for both the outbound and return flights to complete your award booking. ANA Mileage Club will pass on carrier-imposed surcharges when you book awards, but EVA Air does not impose these fees…so you won’t have to worry about that for this particular booking. Like Air Canada Aeroplan, you can transfer points from Amex Membership Rewards at a 1:1 ratio. Transfers usually take 2-3 days. Hot Tip: For some travel inspiration, take a look at some of the best ways to redeem ANA Mileage Club miles. These are only 3 of the many ways to book business class flights on EVA Air. As a Star Alliance member, you can use any of the loyalty programs from any of their partners to book awards. Other good options for booking include Asiana Club, Miles & More, and EVA Air’s own Infinity MileageLands program. Booking with EVA Air’s own program is a bit more complicated, but it can be useful if you have earned a ton of Citi ThankYou Points (which are the only points that transfer to Infinity MileageLands). EVA Air business class is a great way to fly between the United States and Asia. While many airlines restrict the number of business class award seats they make available on any given flight, we have seen pretty good availability recently on EVA Air. Anywhere from 2-4 business class seats have been available from Los Angeles (LAX) to Taipei (TPE). By utilizing stopovers, you can not only fly EVA Air business class, but also see more on your trip. United Airlines, Air Canada, and ANA each allow stopovers on round-trip award bookings, so you’ll have plenty of options. Before we dig into stopovers, let’s start with a more traditional award booking. Let’s say you want to fly from Chicago (ORD) to Taipei (TPE) on one of EVA Air’s Hello Kitty planes (more on that below). If you book via United MileagePlus, you will need 160,000 United miles for a round-trip business class award. Air Canada Aeroplan will require 150,000 miles, while ANA Mileage Club will only require 95,000 miles. Clearly, ANA Mileage Club provides the best option here. As we saw in our first example, ANA Mileage Club is the best way to book a round-trip business class award on EVA Air. However, ANA Mileage Club does not allow one-way bookings, while Air Canada Aeroplan and United MileagePlus do. Now, if you want to book a stopover in Taipei, remember that your next flight to your final destination does not have to be on EVA Air. For example, you could fly from Los Angeles (LAX) to Taipei (TPE) on EVA Air and enjoy a stopover before continuing to Singapore (SIN) on Singapore Airlines. However, the way United MileagePlus defines regions will prevent you from booking a stopover with their program in this example. According to the terms of United’s Excursionist Perk (their version of a stopover), you get a free one-way flight within the same region on a round-trip award booking; United classifies Taiwan as Asia 1 but Singapore as Asia 2. 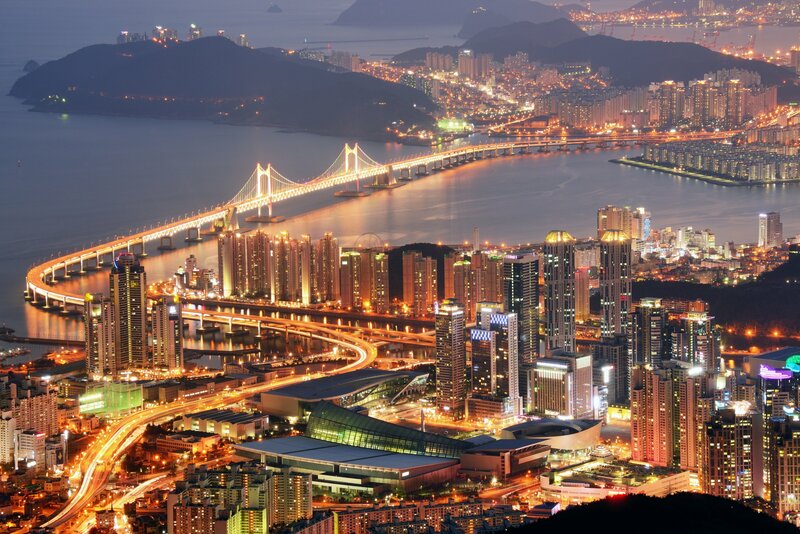 United MileagePlus will let you book a stopover in Taipei on your way to Seoul, though, since South Korea is also classified in the Asia 1 region. 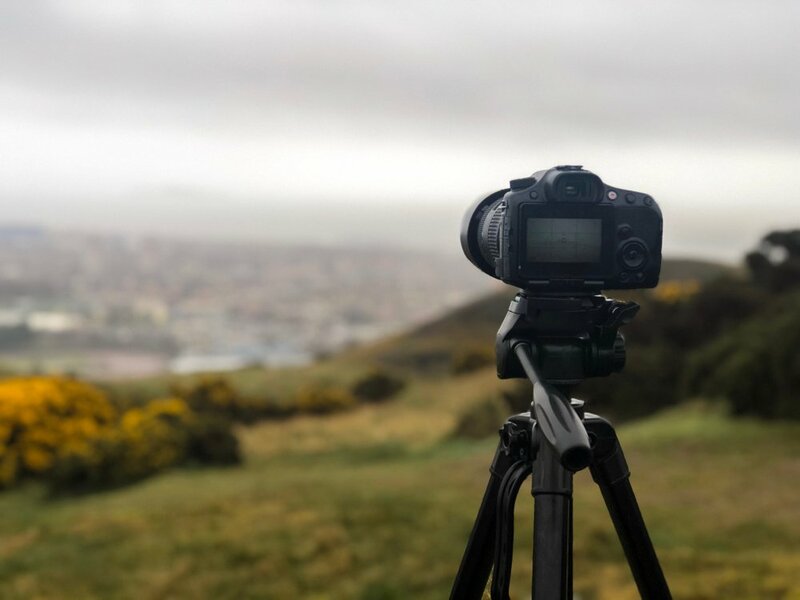 Bottom Line: To really get the most out of your United miles, make sure you know the regions of the places you want to visit. Fortunately, Air Canada Aeroplan and ANA Mileage club won’t require quite as much research. One of the reasons we like using United miles to book flights on EVA Air is that they’re easy to earn. The best way to get more United miles is often through credit cards that earn Chase Ultimate Rewards. The Ultimate Rewards cards each come with bonus categories to help you earn tons of points. Additionally, you can earn United miles directly thanks to their co-branded credit cards provided by Chase. 40,000 bonus miles after you spend $2,000 on purchases in the first 3 months your account is open. Plus earn an additional 20,000 bonus miles after you spend $8,000 total on purchases in the first 6 months your account is open. Get 50,000 Bonus Miles after you spend $3,000 on purchases in the first 3 months your account is open. You can earn Marriott points and transfer those to United at a rate of 3:1.1. Plus, for every 60,000 Marriott points that you transfer, you’ll receive an extra 5,500 United miles. If you want to book EVA Air with Air Canada Aeroplan or ANA Mileage Club, then earning Amex Membership Rewards might be your best bet. There are tons of card options, and each one has bonus categories that can help you earn points even faster. EVA Airways has been pretty good about releasing award space to its Star Alliance partners. You can start searching for award space nearly a year prior to departure; we have seen Aeroplan show award space 355 days before departure, and United show award space 336 days before. Even if you need award space for a flight within 3 or 4 months, it is not uncommon to find business class space for 1 to 3 people. We’ve already touched on what you get from the business class experience with EVA Air, but let’s dive in with a bit more detail. 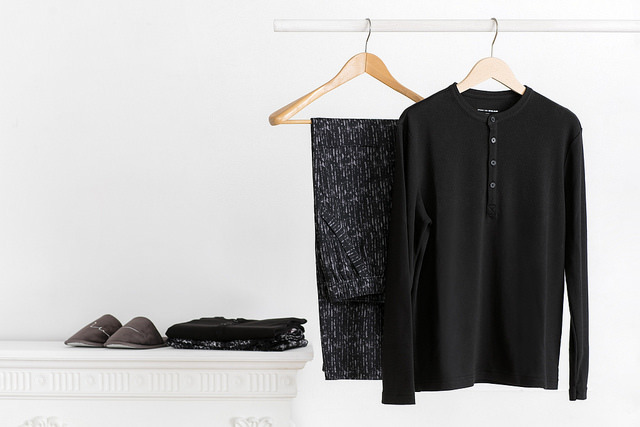 Get comfortable in a set of EVA Air’s business class pajamas. EVA Air’s reverse herringbone business class seats are a great way to fly, but it’s their other amenities that really set them apart from the competition. As you settle in and enjoy a glass of champagne prior to departure, you can unpack your Rimowa amenity kit. It looks like a mini Rimowa suitcase and comes with Clarins toiletries, an eye mask, toothbrush, toothpaste, socks, slippers, brush, and more. You’ll even be given APUJAN pajamas to wear during the flight. Though common in first class cabins, pajamas in business class are a great perk that really take things to the next level. Once you’re ready to sleep, you’ll have more than just a lie-flat seat; a member of the crew can provide you with a mattress pad that will make it even more comfortable. Top it off with a great pillow and blanket, and you’ll be asleep in no time! Another area where EVA Air really shines is their inflight catering. While the food on plenty of airlines leaves a lot to be desired, EVA Air stands out for the quality of their cuisine. You can even pre-order your main course prior to your flight. As we mentioned earlier, EVA Air serves champagne to business class passengers…but it’s not just any champagne. Depending on your flight, you can expect to enjoy Dom Perignon, Krug, or Veuve Clicquot. If you like champagne, this will be a fun flight for you! Book a flight on one of EVA Air’s Hello Kitty planes to make your trip just a little bit more fun. 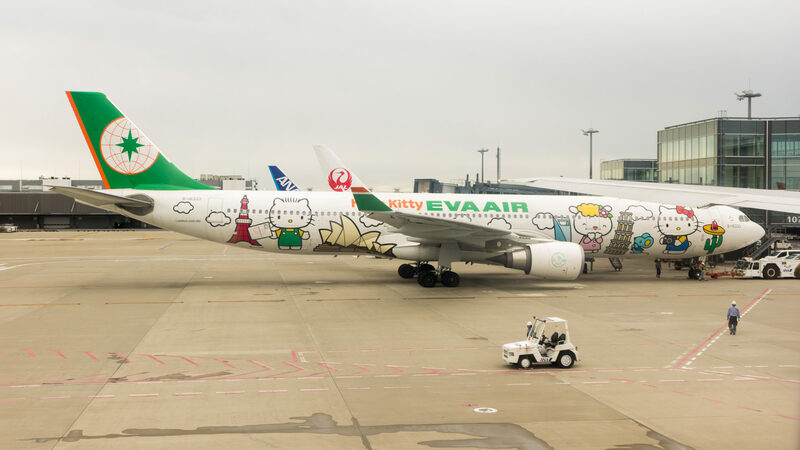 EVA Air has become famous among some flying enthusiasts for their special themed jet — a limited number of routes are operated by EVA Air jets with one of a few Hello Kitty liveries. However, it’s not just the livery that gets people excited: the inflight experience is also full of the Hello Kitty theme. When you arrive at your business class seat, you’ll notice the pillow waiting for you has a Hello Kitty design. From there, you’ll see everything from napkins to bathroom amenities, menus, and snacks will have Hello Kitty all over them. Even your slippers have the Hello Kitty theme! If you want to have a little fun with your flight, see if you can find a route with the Hello Kitty livery and amenities. You can find out where these planes are being flown here. It’s pretty clear that EVA Air’s business class product is a hidden gem that should be at the top of your list. Not only is it a convenient way to fly to Asia from the United States, but you’ll get first class service from start to finish. With so many Star Alliance partners you can use to book a business class award, you won’t have any trouble earning enough miles and points to fly with EVA Air. Now all you have to do is figure out when you’re going to fly! 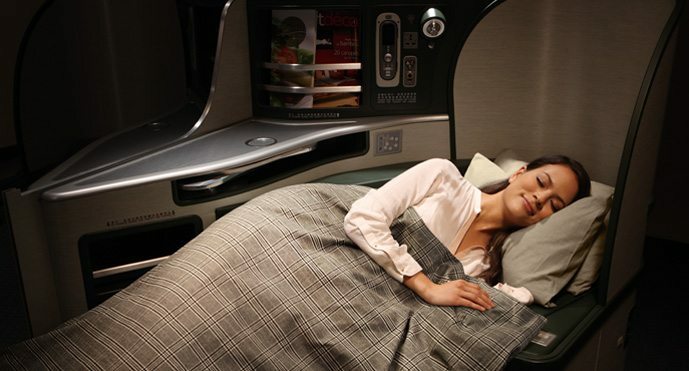 What is the best way to book EVA Air business class? If you need a round-trip award booking, ANA Mileage Club will require the fewest miles to book EVA Air business class between the United States and Asia. If you need a one-way award booking, Air Canada Aeroplan might be your best bet. If you have a bunch of Chase Ultimate Rewards points, United MileagePlus will be your best option. What credit cards can help me earn miles to fly EVA Air business class? There are a number of credit cards that can help you earn the necessary miles to fly business class on EVA Air. If you want to book with either Air Canada Aeroplan or ANA Mileage Club, you can use cards that earn Amex Membership Rewards. TD Bank also provides a co-branded Aeroplan card that earns miles directly. To earn more United miles, you can use cards that earn Chase Ultimate Rewards points or a co-branded United credit card provided by Chase. You can earn Citi ThankYou Points if you want to use EVA Air’s own Infinity MileageLands program to book. What should you expect in business class on EVA Air? EVA Air has a great lie-flat business class seat with direct aisle access. What really sets EVA Air apart are their service, inflight amenities, and catering. New Uber Visa Card Available for Applications! Do you know if it is possible to book EVA Air’s business class AFTER having booked it as ECONOMY? Does the option come up at the time of ONLINE CHECK IN? If not is it considerably more expensive to book at the check in counter? I tried booking a hello kitty flight out of LAX to TPE through United Mileage. The connecting SFO to LAX (United) flight was confirmed, however, the Hello Kitty flight itself was “waitlisted.” This was rather frustrating as it seemed as if space was available, but perhaps EVA was holding it for revenue passengers? Anyone have any insight to this?